Hakea eriantha develops into a medium to tall shrub reaching a height of three to four metres in our New England garden. The usual form has lance-like leaves up to 12 centimetres long by 2.5 centimetres wide. East of Armidale, on the Waterfall Way there is a population with very narrow leaves that are only 5 millimetres wide. Flowers are white and held in small clusters at the base of leaf axils. They appear in spring and are followed by woody, ovoid fruits that have a hooked beak and contain the usual two winged seeds. Sometimes, depending on how well the blooms are pollinated, the fruits are held in large bunches. They persist on the plant. We have been growing Hakea eriantha for many years and have found the species to be hardy, drought and frost resistant. Flowers are well displayed and the fruits are an interesting feature. The wide-leafed form does tend to become a trifle straggly. The narrow-leaved form is a tidier plant. This does not matter, in our garden, as both forms are incorporated in dense shrubberies. 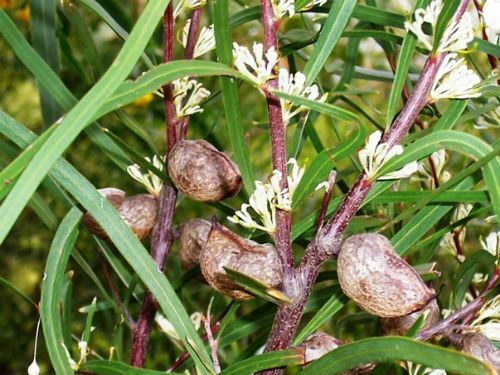 We grow many Hakea species but have found that our visiting Yellow-tailed Black Cockatoos attack the fruits of Hakea eriantha in preference to any other species. The species name refers to woolly flowers. Propagation is by seed. We find that the narrow-leaved form comes true to type.